During CNY, we enjoy this traditional must-eat snack. Whenever any relatives or friends visit us, we'd pan-fry some pieces of this Chinese New Year cake for welcoming them. It’s still Chinese New Year celebration time until the 15th day of lunar calendar. 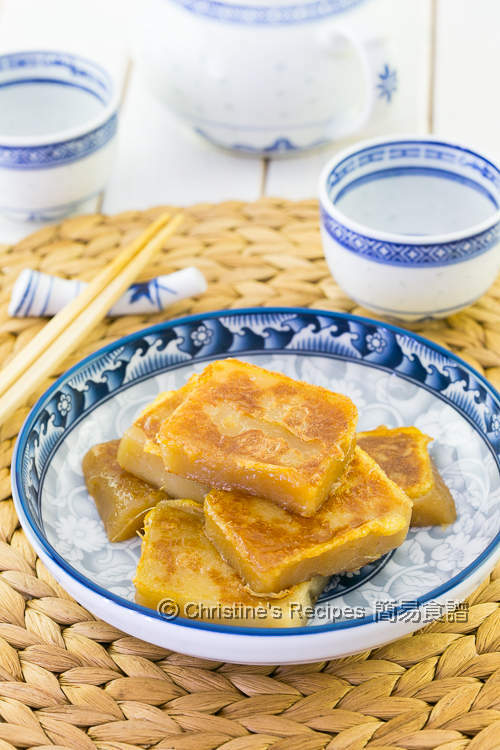 We enjoy all the delicious snacks, radish cake (pressure cooker recipe), taro cake and Chinese New Year cake (steamed in a wok), especially when getting around with friends and family. You might find this CNY cake in Chinese dim sum restaurants all year long. This is a popular, traditional cake in Chinese cooking. When it comes to making this CNY cake, it takes forever to get it cooked through in a wok or steamer. But with an electric pressure cooker, Instant Pot, I can cut short the cooking time a lot. 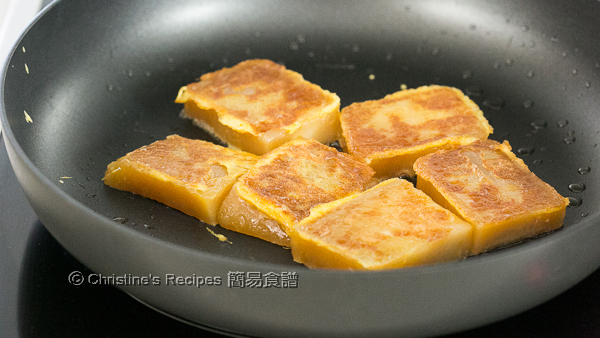 This recipe exactly use up one packet of brown slab sugar (片糖, picture shown here). I made a batch ahead, then pan-fried it next morning, and brought it along to share with my friends after church. They commended with thumbs up, saying it’s not too sweet with the texture just right to their liking. It’s a kind of remarkable reward when you cooked with your heart and soul for your loved ones, isn’t it? Use a deep pot, cook 450 ml of water with the sugar until the sugar is completely dissolved. Pour in the coconut milk and oil. Combine well. Set aside to let it cool down. Combine and sift the glutinous rice flour and wheat starch. Sift the flour mixture into the sugar mixture in 3 batches. Stir to combine very well. You’ll get a very smooth batter. Drain through a fine sieve to get rid of any lumps inside. Grease the containers. Pour in the batter. Pour in 1½ cups of water into the Instant Pot. Transfer the round container first, followed by the rectangular one. Cover with foil. Close the lid and turn to “sealing” position. Press “manual” button, cook on high pressure for 30 minutes. After finishing cooking, let the machine run “natural release’ for 10 minutes. After the pressure valve drops, remove the containers and let them cool down completely. Chill in fridge for at least 3 hours until it turns firmer for easily slicing into pieces. When you’re ready to serve, coat each slice with whisked egg. With a non-stick pan, pan-fry both sides until golden brown over medium-low heat. Serve hot. It’s best to use glass containers. You may use bakery tray or foil tin instead. I won’t recommend to use plastic take-away boxes though as they are not suitable for high-heat cooking. This is pretty cool! I would have never thought of using instant pressure cooker to make this classic. Excellent, Christine! I just purchased my instant pot. 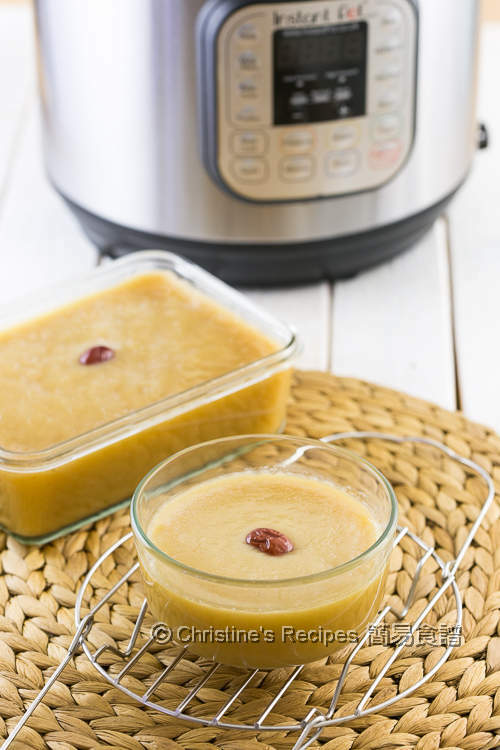 I hope that you will have recipes using the instant pot for soups, fish, and meals. Welcome you on board. You'll love your instant pot. I've created some instant pot recipes already. 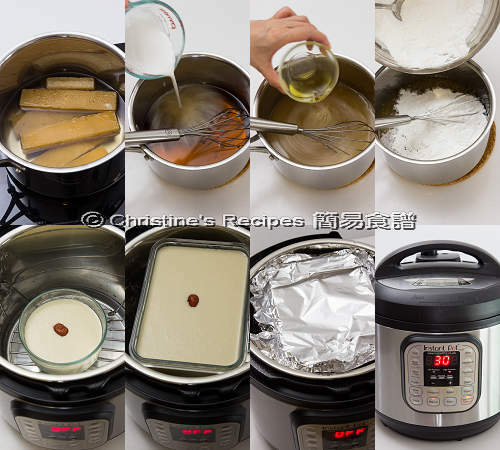 Please browse the folder of "pressure cooker" under the recipe index. I don't have an Instant Pot. Can I use other pressure cooker? Sure, you can make it in other pressure cooker. Yet, you have to adjust the cooking time and refer to your user manual. Hi Christine, Amazon UK does not ship this to Australia. I just tried. Yeah, I also found that sometimes the site displays that they don't send the machine to Australia. No idea at all. But I just checked Amazon UK again. They send right now. Please try again. Can I use other brown sugar to replace brown slab sugar? Can I use potato or corn starch to replace wheat starch? I haven't tested with brown sugar. Think that it works too. Both potato and corn starch are very different from wheat starch. The texture of end product will be very different too if you replace it. If I don't cook the battet in Instant Pot, how long and in what heat level should I steam the batter? Please advise. I've got a traditional Chinese New Year cake recipe for steaming in a wok on this site. Please hop over there to have a look. Hope it helps.